In Murray, Utah, order mulch, compost, garden soil, top dressing and other landscaping materials from the experts at The Dirt Bag. Here at The Dirt Bag, we are exceptionally proud of our high-quality materials and affordable pricing. For our clients in Murray, we provide free delivery for all of our bagged products. We will deliver native Utah sod and bulk landscaping materials with only a small delivery charge. We have everything you need to complete your northern Utah landscaping and garden projects and ordering from us couldn’t be easier. One quick call or a few clicks or taps and we will deliver your materials to your door in this three to four days. We are known throughout northern Utah for our free delivery of bagged dirt and landscaping materials. For residents in Murray or anywhere in Salt Lake County, we will deliver garden soil, compost, mulch, play sand, shredded bark mulch, wood chips, screened topsoil and soil conditioner in our durable one cubic yard bags. Our bags are reusable and resealable for your convenience. We will deliver them to your location of chose and even place them where you specify. You don’t even have to be there for delivery, as long as you mark your desired location for our drivers. For larger landscaping materials orders, check out our bulk products page. Available for bulk delivery is our exclusive Garden Soil Plus blend, created just for planting beds in the Salt Lake region. 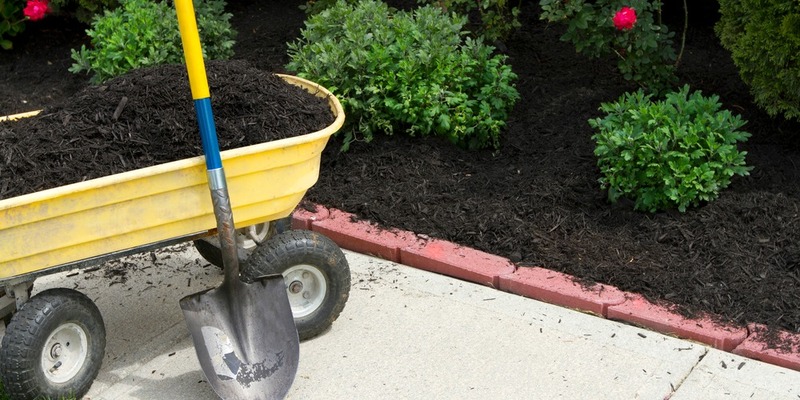 You can also place a bulk order for organic compost, dark brown or black mulch, topsoil and soil conditioner. We also offer bulk delivery of Oquirrh gravel, pea gravel and Weber cobble. You can use the handy landscaping materials calculator on our website to determine how much you need of each product. Then just pick up the phone and make a quick call to place your order. Our helpful, friendly staff will have you set in no time, so all you have to do is sit back, relax and wait for your delivery. The Dirt Bag is proud to offer our native Utah sod delivery for our Murray customers. This Kentucky bluegrass hybrid is locally grown and designed specifically to thrive in the northern Utah climate. Our sod is a low water use product that requires minimal care. We deliver your sod already loaded on pallets so you won’t have to break your back loading and unloading. Each pallet covers approximately 540 square feet, and our minimum order is four pallets. Order 10,000 sf or more of our water-wise sod, and we will waive your delivery charge in Salt Lake County. Contact The Dirt Bag today to learn more about our products, or to place your order for garden soil, mulch, compost, play sand or any one of our affordable landscaping materials.